In this post I am going to tell you about the detailed IBPS PO Prelims Syllabus 2017. IBPS PO Preliminary Exam is very near. It is important for you to prepare hard for this exam as competition is quite tough. However once you qualify the prelims examination the competition will be limited. In the main exam only selected candidates will contest the final battle. Therefore it is of utmost important for all of you to do well and qualify the first hurdle. It is also true that everybody cannot get selected. However what you have in your hand is to make your best efforts. If you put your best efforts you will surely get success in this exam or in the upcoming exams. One important aspect of preparation is to have good idea about the syllabus. Although there is no fix syllabus in competitive exams. However based on the previous years papers there is always an indicative syllabus. You should prepare thoroughly as per the syllabus. Apart from the preparation as per the syllabus, you should also attempt previous years papers as well as mock tests for the exam. Previous years papers are a very good source for the preparation. These papers gives you an indication about the type of questions as well as pattern of questions as well as difficulty level of questions. 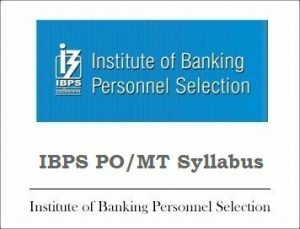 IBPS PO preliminary examination 2017 will be a computer based online test. There will be three sections, namely, Quantitative Aptitude, Reasoning Ability and English Language. The paper will be of 100 marks and of 60 minutes duration. There will be a total of 100 questions. Remark: This IBPS PO Prelims Syllabus 2017 is only an indicative syllabus based on the previous years papers of this examination.